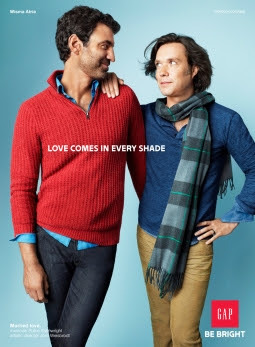 A stylish film running online in the U.S. and on broadcast outside the States accompanies colorful print ads featuring some famous celebrity pairings, including actors Michael J. Fox and Tracy Pollan, representing "True Love," musician Rufus Wainwright and artistic director Jorn Weisbrodt, who stand for "Married Love," while "Fatherly Love" figures rapper Nas and his famous blues musician pop, Olu Dara. The ads and film were shot by director/DP Peggy Sirota.